You are here: Home / News / Chicago Violence And Who Is Responsible. Chicago Violence And Who Is Responsible. 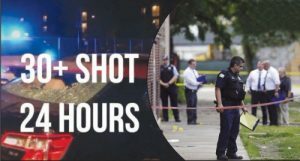 (ThyBlackMan.com) Chicago crime is and remains out of control and yet there are hypocrites from every angle. Chicago crime today is a much more complex situation than it appears. First we need to learn to be responsible for saving, building and rebuilding our own African American and minority communities instead of waiting for the political or sociological white man savior. Don’t just blame “black” America, though we all are responsible for what we choose to do. But responsibility and accountability are two different things and there are more elements at play than just “black” people. Especially when the powers that be create and allow imagery, psychological, sociological, economic and political conditions that contribute to broken families, despair, poverty and crime. Then they profile and target the victims of their creations. Secondly African Americans need to hold our people accountable. That includes your friends, cousins etc who are causing the violence. That is a huge problem. Yet too many of our people would rather blame the city, push back against the police, be part of the problem or make excuses. That in part is why the crime continues, many “black” people so clueless that they have no idea they are being allowed to exterminate their own kind. As I mentioned earlier in this article, I am not ignoring the political establishment nor the conditions allowed by it which add to a climate where people want to get involved in crime. If the Mayor and the Police Chief cannot get this under control, they both should be legally removed from office. In fact, they should have been replaced with people who can control the city. The mayor is allowing this because blacks are killing blacks and “undesirables” are killing “undesirables“. His approach is obviously “let them all kill each other off“. As the son of a Jewish paramilitary officer and a member of a family which fell victim to Arab attacks, Rahm Emanuel is no stranger to violence and knows who to call upon to help stop it (even though he took ballet lessons and graduated from ballet school). He spent time in Israel and he saw how they handle things. Emanuel’s own father stated that Rahm was not one to take the initiative in making things happen so I ask why in the world is he the Mayor of the most dangerous city in America? Therefore I suggest to you that he is intentionally allowing the violence or he was “selected” for the office to allow just that.. The solution is multi-faceted but not hard, if those in positions of power want a real solution. And neither permitting, promoting nor allowing genocide nor self-destruction are real solutions, depending on who you ask. And Chicago should have the largest gang/drug multi-jurisdictional task force in the country. it should include ICE, FBI, local police, state police, U.S. Marshals and the national guard. This is not being done on purpose. Has there even been a real study by the Justice department, psychologists and sociologists as to why so much crime and violence is happening? Do they already know or is it they do not want to know? Or even deeper, is there a covert plan in place to promote and allow such violence and self-destruction? Hypocrisy. Notice when a white kid shoots everybody in a school there is a rush to prevention and solutions. At least a strong and sincere effort by many. As for all the “black” activist groups, where are you now? Nation of Islam why aren’t you swarming all over Chicago? Al Sharpton and Jesse Jackson where are you? Bernice and the King family where are you? NAACP and SCLC and Concerned Black Clergy and 100 Black Men and Women, where are you? Or are you simply a bunch of opportunists who only speak out against injustice when it comes from white people and the police? Wake up. The surge in crime in Chicago will stop when people with the real agenda to stop it step up. That is not happening and has not been happening. These levels of crime in Chicago, like anywhere else in this country, will stop when responsibility and accountability are a mature priority for all of those who are allowing, promoting, accepting or contributing to such crime. Until then, sadly it will continue. But sticking your head in the sand or just blaming a few contributors to the problem will never resolve anything. Chicago is an example of an American un-perfected, but still useful form of psychological condition which has been demonstrated by the B.F. Skinner psychological conditioning box coupled with the teachings of self hatred in people of color not unlike many white supremacy racist psychological contrivances that have been deployed globally to advance white supremacy around the world designed to get people of color to kill themselves off. Chicago is a psychological open sore deliberately left untreated.The early white colonizers of this land used native Americans or Indians to hunt down and kill other native Americans or Indian tribes.This kind of treatment continued through the Revolutionary War and the Civil war where many southern chattel slaves were enlisted by the confederate armies to fight against the union armies who were fighting to free the southern chattel slave themselves, thus they were fighting against their own freedom.This killing phenomenon also occurred in every world war,the Korean Conflict, Vietnam War,throughout the middle east, and continues to this day. White supremacy which has taught self hatred in people of color is the prime cause of the killing in Chicago.The citizens of Chicago must come to grips with their collective psychological disorder. The Vietnamese did it. They did not buy white supremacy and stopped killing their north Vietnamese cousins, sisters and brothers. The South Koreans are reluctant to kill their North Korean cousins. Muslims are also coming to the realization that they are killing their own brothers, sisters and cousins out of a sense of inferiority and self hatred.Knowledge and love of self will liberate the citizens of Chicago from a collective felo de se ( suicide ). I can say as a legal analyst and former detective and mediator that this is a much more complex situation than it appears. First we need to learn to be responsible for saving, building and rebuilding our own communities instead of waiting for the political or sociological white man savior. Secondly African Americans need to hold our people accountable. That includes your friends, cousins etc who are causing the violence. That is a huge problem. Yet too many of our people would rather blame the city, push back against the police, be part of the problem or make excuses. That in part is why the crime continues. Thirdly I am not ignoring the political establishment nor the conditions allowed by it which add to a climate where people want to get involved in crime. If the Mayor and the Police Chief cannot get this under control, they should both be removed from office. In fact, they should have been replaced with people who can control the city. The mayor is allowing this because blacks are killing blacks and “undesirables” are killing “undesirables”. His approach is obviously “let them all kill each other off”. As a former member of the Israeli military, the Mayor of Chicago clearly knows how to stop violence, punch a dent in it or call in others who can. But he is not doing so on purpose. The solution is multi-faceted but not hard. And Chicago should have the largest gang/drug multi-jurisdictional task force in the country. it should include ICE, FBI, local police, state police, U.S. Marshals and the national guard. This is not being done on purpose. Has there even been a real study by the Justice department, psychologists and sociologists as to why so much crime and violence is happening? Hypocrisy. Notice when a white kid shoots everybody in a school there is a rush to prevention and solutions. Atleast a strong and sincere effort by many.